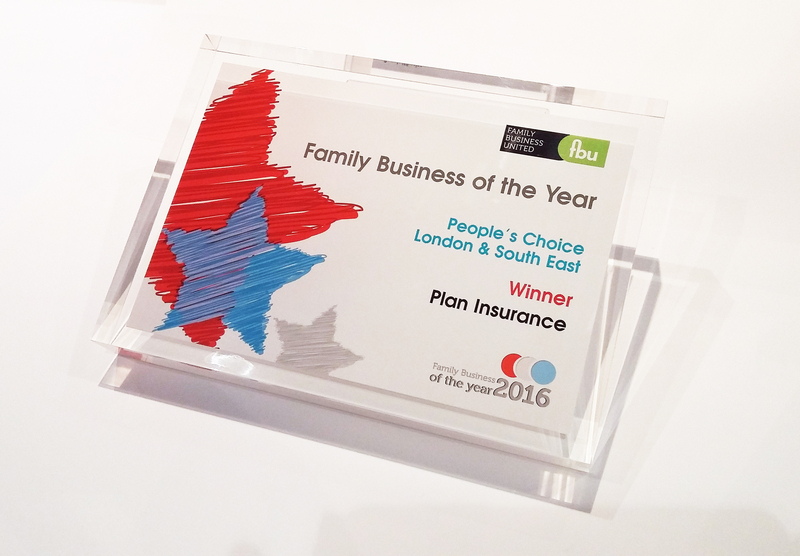 Plan Insurance Win Family Business Of The Year Award 2016! Posted by Pamela Eve on June 7, 2016. We were winners on Thursday night at the Family Business of the Year 2016! The prestigious Family Business United Awards Gala Dinner took place at Mayfair Hotel, London on 2nd June, celebrating the contribution family firms make to the UK economy. We weren’t expecting to be celebrating but we picked up the People’s Choice Award for best family run firm in London & South East region! The awards, in their fourth year and hosted by Family Business United, are a much valued magazine and resource centre for UK family businesses. Plan was established 25 years ago by Peter Georgiades and his eldest son, Scott. Peter’s remaining two sons Ryan and Grant joined the business over a decade ago and have helped it to grow steadily. From our Purley offices, we specialise in commercial motor insurance. Peter stepped back from overseeing proceedings in 2001 but still enjoys servicing a book of loyal clients. Plan Insurance undertook a proactive campaign to get the support of the broader community to vote for them in these awards. The public really supported them and not only did they triumph in the London & South East Award, they also finished ninth in the National People’s Choice category too. They are a great British family firm and truly deserve all the plaudits that winning this award brings. What made Plan stand out? The brothers realise that it’s not just about designing a logo. As commercial vehicle insurance brokers, Plan’s entire company ethos is geared towards helping to keep UK businesses motoring by minimising the chances of being off the road and unable to earn. Fresh ideas and enthusiasm has been bought to the company and makes Plan stand out – with a dynamic management team that sees value in digital services and bespoke IT systems, streamlining processes and engaging in social media. Cycling is something the family are incredible passionate about. Recognising a gap in the market for specialist cycle insurance, Yellow Jersey Cycle Insurance was launched 18 months ago. Already they are working with Team Wiggo (Bradley Wiggin’s race team) and Matrix Fitness (Laura Trott’s race team) and are continuing to go from strength to strength. Plan is establishing itself as a thought leader within the commercial motor industry providing expert opinion and advice in areas of regulation. The Plan team supports numerous local, trade and national charities through fundraising and other activities. I think that’s fairly unheard of as people don’t tend to want to engage with commercial insurance brokers in their free time. If you give a high level of service your customers will value you and we owe a massive debt of gratitude to our customers and our hugely dedicated team and everyone else who voted for us. We are delighted to have won this award. To ensure their premiums are competitive Plan source policies on behalf of their clients from an extensive panel of leading commercial insurers. If you’d like your business’s insurance to be arranged with personal care and attention why not visit Plan Insurance where you can request a call or view further information regarding our services. How much do family firms contribute to the UK economy?